Pittas are medium-sized birds with a large head, short neck, strong bill often hooked at the tip, round body, short rounded wings, short tail, longish legs, and strong, large feet. They are some of the world's most brightly colored birds and are sometimes called the "jewels of the forest" and "jewel thrushes" (because of similarity to thrushes). Many species contain patches of white, chestnut, turquoise, green, red, purple, and black, which are found on the chin, breast, or body areas that are hidden by dull-colored wing feathers. Both sexes contain these same colors, however females are generally duller. Adults are 5.9 to 11 inches (15 to 28 centimeters) long and weigh between 1.6 and 7.1 ounces (45 and 202 grams). Pittas are found from Africa to the Solomon Islands and from Japan through Southeast Asia to New Guinea and Australia. 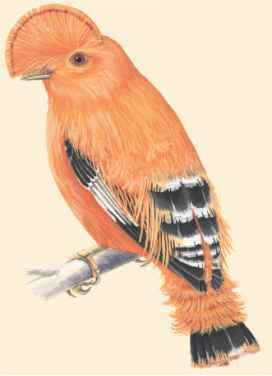 They are mostly found in peninsular Malaysia, Borneo, Sumatra, and Java. One species is found in India, two species are found from west-central to east-central Africa, and two species live along the northern and eastern coasts of Australia. Most pittas inhabit the understory (level of tropical forests nearest ground level) of lowland tropical and subtropical forests. They prefer areas that are moist, such as those near rivers and streams or in shaded ravines. Some pittas inhabit phylum class subclass order monotypic order suborder family moist, montane (mountain) forests from sea level to elevations of 8,200 feet (2,500 meters).